64 pages AND 26 words that highlight memorable victories & collective moments in LGBTQP (Lesbian, Gay, Bisexual, Transgender, Queer, Questioning & Pansexual) culture. THIS is Jacinta Bunnell's 4th book and the first with acclaimed illustrator Leela Corman. As you add your own colors to the pages, we hope you are left asking, “Isn't everything fabulous in this world just a little bit gay?” This notion is celebrated on every unique page, made up of inked and framed line drawings with beautiful typography. Written by Jacinta Bunnell. Illustrated by Nathaniel Kusinitz. A coloring book that features princesses building rocket ships, beasts who prefer dresses, and new pronoun ideas. Julie Novak & Jacinta Bunnell. 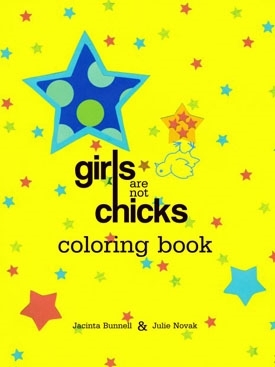 A coloring book for young feminists featuring girls challenging patriarchy, street harassment and restrictive dress codes.